smaller industrialized Asian countries etc. — the logic of safe havens is for our focus to drift toward the places that matter least. Those who argue for radical change invariably point to the various wars the United States has fought in recent years — notably Iraq and Afghanistan — and simply assert that we need to get ready to do a lot more of them. Unfortunately, this line of argument ignores the fact that these wars are the result of past American mistakes. 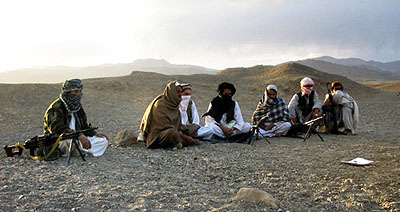 The first error was the failure to capture Bin Laden and his associates at the battle of Tora Bora, which allowed al Qaeda’s leaders to escape into Pakistan and thus ensured that the United States would become enmeshed in Afghanistan….The second mistake was the foolish decision to invade Iraq in 2003, which led us into yet another costly insurgency. ….In short, the current obsession with counterinsurgency is the direct result of two fateful errors. We didn’t get Bin Laden when we should have, and we invaded Iraq when we shouldn’t….The obvious question is: Does the United States really want to base its military strategy on two enormous blunders? I’m sympathetic to both of these points of view, but not entirely convinced. Our concern with safe havens really does seem to get used as a stand-in for serious argument a little too often, but I wouldn’t get too enamored of the idea that safe havens don’t matter. Whether it’s in Hamburg or Helmand, harrassing the bad guys is plenty necessary. The difference is that in Hamburg the German state already has a police apparatus with plenty of authority in place, while in Helmand we don’t. And the only way to get it is to have a presence there. Likewise for Walt’s argument. My big concern is that we’ll allow military organization to drive our national security policy, rather than the other way around. In other words, if we build a big COIN capability, then we’ll end up using it whether we should or not. But the lessons of Afghanistan and Iraq might very well be quite different: namely that we should do everything we can to avoid COIN conflicts in the first place. We’re not very good at them and the return to national security from getting involved in them is generally either slight or negative. But I’m not 100% convinced about either of these arguments. I don’t much like the idea of a fixation with either safe havens or COIN driving national security policy, but it’s hard to deny that safe havens really are a problem and that small conflicts against irregular troops really do seem likely to define our future more than big wars against other major powers. And if that’s the case, then we need to deal with it. This argument has been going on for years, and I’m only bringing it up here again as a conversation topic. So go ahead and school me.